Of the roughly 25,000 hybrid SUVs a year made by Ford, the vast majority are Escape Hybrids. But the Mercury Mariner Hybrid uses the same powertrain in a dressier, more stylish package that’s identical under the skin. Or consider the (very rare) Mazda Tribute Hybrid—again, the same vehicle underneath. The 2009 Ford Escape Hybrid is a viable and sturdy contender in the family crossover arena. Gas mileage is excellent for a compact SUV, and optional mechanical all-wheel drive sets it apart from softer competitors. Editors at TheCarConnection.com drove the new 2009 Ford Escape Hybrid to bring you this hands-on review of its performance, styling, quality, comfort, and features. Editors also evaluated the Ford Escape Hybrid against its competition to provide you the best information and help with your shopping decision. The 2009 Ford Escape Hybrid compact SUV is the latest model of Ford’s pioneering hybrid. In 2004, it was both the first hybrid SUV and the first hybrid built in the United States. It’s capable, attractive, and in the last few years, a perennial bestseller for Ford. Buyers nervous about the durability of hybrids should be reassured by the fact that more than 1,500 Ford Escape Hybrids are in regular use as New York City taxicabs. Ford has consistently upgraded its hybrid-electric powertrain over the years. For 2008, the hybrid Escape got an enlarged 2.5-liter four-cylinder engine with dual overhead cams, raising 153 horsepower. There is only a single engine/transmission option. Under the right circumstances, the Escape Hybrid will run in electric-only mode up to almost 40 mph. The hybrid-electric system acts as an electronic continuously variable transmission (CVT), letting the engine run at its most efficient speed regardless of road speed. Acceleration is good, although putting the pedal to the floor quickly runs the engine up to a howl. But it’s fuel economy that really makes the 2009 Ford Escape Hybrid. The EPA rates it at 34 mpg city/31 mpg highway, and during a four-day road test with substantial highway mileage, we consistently averaged 30 mpg or very close. Unlike the handful of other all-wheel-drive hybrid crossovers and SUVs, the Escape Hybrid AWD drives all four wheels mechanically. 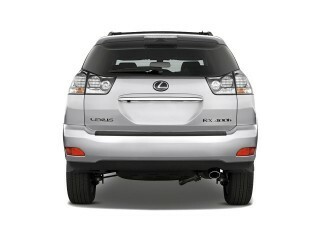 Other SUV hybrids use an electric motor to power the rear wheels. Under extreme circumstances, that motor could shut off to prevent overheating or damage—leaving the vehicle with only two driven wheels. We view this as a plus for the 2009 Ford Escape Hybrid. That said, the Escape isn’t a rock-climbing off-roader. It’s fine for dirt and gravel roads, has a decent 8.5 inches of ground clearance, and holds the road nicely, thanks to a suspension that was completely retuned last year. The 2009 Ford Escape Hybrid is a square, upright vehicle that’s actually a bit larger than it looks. Its latest restyling takes it further into the tough-SUV mold, which some competitors have moved away from. There’s decent room for four adults inside the 2009 Ford Escape Hybrid, and every passenger sits high up, with good views out the windows. The front seats are better than the rear seat, which has a short bottom cushion and may be better for children than taller adults. The 2008 restyling vastly improved the cabin décor and materials. Instruments are easy to read, with blue-green backlighting, though the high-gloss black plastic surfaces seem to attract dust like a magnet. Our least favorite facet of the 2009 Ford Escape Hybrid is the wind noise, which is louder than expected and worse than in most other compact SUVs. This may reflect the age of the basic design, which launched a decade ago and has a more upright windshield than it might be today. The mirrors also generate a lot of noise at speed, though they are pleasantly large and provide excellent visibility. Our test Escape Hybrid also suffers an annoying, moaning howl right at the 2,000-rpm mark, though it’s the only one we’ve driven with that problem. The folding rear seat proves annoying. It requires all three headrests to be removed—but there’s no place to stow them. Once the seat bottom is folded forward and the back flipped down, the load floor is flat and the Escape Hybrid offers 66.3 cubic feet of cargo space. Still, those headrests! Our test vehicle comes with the optional LED interior lighting, which offers a choice of several different colors for floor, console, and cup-holder lighting. It's fun the first few times, but feels like a gimmick after that. Ford’s Easy-Fuel capless gas filler system is a nice feature that eliminates the need for a separate gas cap. Another sign of the Escape Hybrid’s age is the lack of integration between the instrument cluster and the console screen. The cluster contains a mode gauge that shows when the battery charges and discharges, but all fuel efficiency data remains on the central console screen. The newer 2010 Ford Fusion Hybrid has both parts integrated and superb graphical displays in the cluster right in front of the driver. Finally, the air conditioning compressor in the 2009 Escape Hybrid remains driven by the engine, which means any time the AC is switched on, the engine must start. Newer hybrids (including the 2010 Fusion Hybrid) use electric air conditioning that can run even with the engine off. As a family vehicle, the 2009 Ford Escape Hybrid has to score well on safety, and it does. The Insurance Institute for Highway Safety (IIHS) deems it a Top Safety Pick, and the National Highway Traffic Safety Administration gives it five stars in its front and side impact tests. Dual-stage front airbags and side airbags are standard, as are anti-lock brakes, electronic stability control, and traction control. Ford has won kudos for its Sync interface to infotainment systems, and justifiably so. Microsoft and Ford partnered to develop Sync, and it’s remarkably versatile. Users can pair (most) Bluetooth mobile phones and connect MP3 players, then operate them entirely by voice command—improving safety significantly. Other Sync features and options include Sirius Travel Link, also voice controlled, which offers navigation, real-time traffic data, weather info, and even local fuel prices. 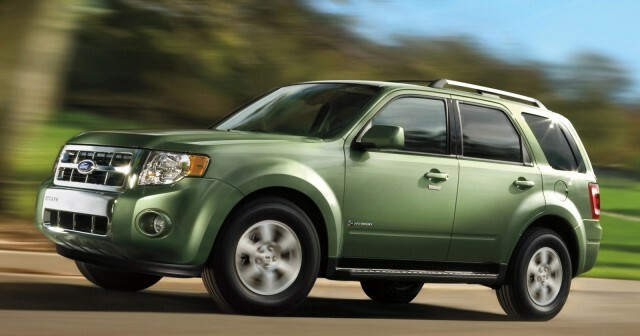 The 2009 Ford Escape Hybrid retains a rugged, conservative look that is equally at home in the city and the country. The 2009 Ford Escape Hybrid arrives on dealer lots fresh off a 2008 makeover, and as such, it doesn't change much from last year’s model. The exterior styling of the 2009 Ford Escape Hybrid leans much more toward the 1990s SUV glory days than contemporary cutting-edge hybrids. The Ford Escape Hybrid is, in the words of Edmunds reviewers, “a compact SUV…available in two trim levels,” which are the base and upscale Limited models. Jalopnik reports that the Ford Escape Hybrid is “virtually unchanged visually,” and it still carries “a bold front end [that] combines with sleeker lines to result in” what Kelley Blue Book “an Escape that’s both more rugged and more refined than its predecessor.” Cars.com points out that the Escape Hybrid “has maintained a relatively traditional SUV appearance with its upright grille and angular profile,” and the conservative styling is also reflected in the dearth of hybrid badging. Cars.com notes that, “as opposed to GM, which slathers its full-size SUV hybrids with stickers and badges, Ford has shown some restraint,” and the Escape Hybrid’s only green logos are badges on the sides and liftgate. Reviews read by TheCarConnection.com show that the Ford Escape Hybrid’s interior is pleasant, but somewhat dated. TheCarConnection.com’s own editors discovered one major discrepancy with the interior, as the instrument cluster and center console are woefully unintegrated, reflecting Ford’s inability to incorporate all of the latest technology throughout the Escape Hybrid. Otherwise, however, the interior wins over reviewers with what Kelley Blue Book calls a “much more contemporary demeanor” than the outgoing Escape Hybrid. Despite the modernized look, Kelley Blue Book still feels that the Escape Hybrid’s interior “seems a bit dated when compared with newer compact SUV offerings.” Ergonomically, Ford’s engineers succeed with the Escape Hybrid’s cabin, and Edmunds appreciates that “the climate and stereo controls have a tidy layout.” Impressively, Edmunds also reports that “the optional large display screen can show the navigation, audio and fuel-economy functions at the same time, without appearing cluttered.” While the outgoing Ford Escape Hybrid featured a green backlight for the instruments, the new 2009 Escape Hybrid is bathed in an Ice Blue glow from the interior lighting, and reviewers love the new color combination. For even more variety, the 2009 Ford Escape Hybrid now offers a driver-selectable color option that enables the driver to switch between a number of interior colors. The 2009 Ford Escape Hybrid is the most versatile and utilitarian hybrid on the road, and while it can’t match a number of hybrids in any one performance category, its overall performance makes it worth considering. The 2009 Ford Escape Hybrid lives up to its billing as one of the most fuel-efficient vehicles on the road, and it’s certainly the most efficient SUV on the market today. Both trims of the 2009 Ford Escape Hybrid are propelled by the same powerplant, which Edmunds says “consists of a 2.5-liter four-cylinder gasoline engine and two electric motors/generators” whose combined “net output is 177 hp.” Despite the relatively paltry horsepower number, reviews read by TheCarConnection.com show that the 2009 Ford Escape Hybrid is surprisingly quick off the line. Jalopnik reviewers find that the “2009 Hybrid…provides stronger acceleration than previous Escape Hybrid models,” and Cars.com claims it “delivers acceptable acceleration that gives it enough power to get up to highway speeds safely.” This is largely due to the electric motors, which “make peak torque almost immediately,” according to Edmunds. That effect decreases markedly at speed, however, and Jalopnik reviewers report that “passing response is not strong, especially above 60 mph.” The 2009 Ford Escape Hybrid also gets a slight power boost over last year’s model, and it now makes 20 more horsepower overall than the 2008 version. The 2009 Ford Escape Hybrid is in desperate need of a materials upgrade, but at least the ride is quieter than before. The 2009 Ford Escape Hybrid represents a step up in terms of quality from the outgoing version, but reviews read by TheCarConnection.com show this is still very much a flawed SUV. Ford’s engineers make a concerted effort to reduce NVH (Noise, Vibration, and Harshness) levels in the new Ford Escape Hybrid, and reviews read by TheCarConnection.com show they meet with mixed success. Kelley Blue Book thinks that the improvement is noticeable, quoting a Ford source that claims a “12-percent reduction in highway noise,” but ConsumerGuide finds that “wind and road noise are present.” Edmunds adds that the Escape Hybrid’s gasoline engine is “noisy under hard acceleration,” although when leaving a stoplight the Escape Hybrid is nearly silent, since it runs on its electric engines. The 2009 Ford Escape Hybrid suffers from a brake downgrade, but in terms of impact safety, it simply can’t be beat. The 2009 Ford Escape Hybrid stands out in terms of crashworthiness, but for 2009 Ford, rather surprisingly, removes the four-wheel-disc brakes from the Escape Hybrid. While the front wheels still get anti-lock discs, the rear brakes are now an antiquated drum design. The 2009 Ford Escape Hybrid comes with a decent complement of standard features, although one glaring omission is repeatedly mentioned in reviews surveyed by TheCarConnection.com. Beginning with what the 2009 Ford Escape Hybrid does offer, Kelley Blue Book reports that the Escape Hybrid’s “standard safety equipment includes six airbags and anti-lock brakes (ABS), as well as AdvanceTrac traction control with Roll Stability Control.” Edmunds reviewers add that “full-length head curtain airbags with a rollover sensor are standard,” although they are disappointed to find “one unwelcome change this year,” which they describe as “the puzzling fitment of drum brakes to the rear” wheels of the Ford Escape Hybrid. Although SUVs are typically criticized for offering poor driver visibility, the high seating position within the Escape Hybrid helps provide the driver with impressive sightlines. ConsumerGuide notes that “visibility is very good in all directions,” and with its latest Escape, Ford seems to have almost completely eliminated visual obstructions. With the introduction of the Sync system—co-developed with Microsoft—the 2009 Ford Escape Hybrid muscles its way into the class lead in terms of technology. The 2009 Ford Escape Hybrid is the first Escape Hybrid vehicle to receive Ford’s excellent new Sync interface, and Sync is now the flagship feature on Ford’s hybrid SUV. For the Ford Escape Hybrid, the features list doesn’t end with the standard fare. On the latest Escape, Ford makes available a number of optional features that significantly increase the Escape Hybrid’s high-tech credibility. First and foremost is what Kelley Blue Book calls the “DVD navigation with 10GB hard drive storage,” a system that Cars.com thinks “has much-improved graphics and new capabilities, like displaying weather maps, gas prices and sports scores.” Car and Driver adds that the navigation system allows you to “rip MP3s to the 10-gig hard drive and upload family photos to use as wallpaper” on the navigation screen. Other available features for the Ford Escape Hybrid lineup include side step bars and a roof rack with crossbar bracing.